Guesthouse, with quail, cactus, & desert. Cottage, 1 bedroom, bathroom. Sleeps two, queen size bed. Futon in living rm. Guesthouse, Detached from main house. Brick exterior, Air/Heat. Living looks out to mts, in the north. In suite Bathroom: Walk in shower. New full kitchen, S.S. applainces. 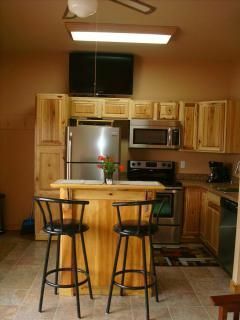 Self cleaning stove, Refrig with Ice-maker, Microwave, dishwasher, deep sink with tall fawset. Pantry, all new cabinets, counter tops. Great lighting. Bar counter, for two, two stools. Front and back doors, private patio off bedroom. Desert views, plants, birds, sunsets. The quail come in and picnic on the bird blocks. Mts off in the distant to north and east. Box canyon is one of our favorite day hikes. We hope that you enjoy the desert as much as we do each winter. It truely is a beautiful part of our wonderful world. We hope that you stay here and feel at home! Put a chunk of wood into the chimneas on the patio. After a day of hiking. Our guesthouse is cozy, southwestern, in a natural desert. Cozy cabin, with ranch space. Rodeo grounds few miles away. Or for hiking near by mountains all around. Anyway we leave the lights on the porch. Catalina Mountains to SE, Superstition Mts to north , beautiful sunsets and best weather in late fall and winter. We love staying here, taking care of quail and guests. So come on by and stay awhile. We are retired, to the south in the winter months. Have been coming to Arizona to enjoy desert and family over the years. There are a lot of things about Arizona that make it a ideal place to stay. This home was, Len's Mom's. She enjoyed the birds and the unique plants. We are continuing the bird feeding and viewing. Caring for the many cactus. And adding to the mix. Some are well over 100 years. The first owner would grow plants mainly cactus. and blooming ones. The guesthouse was a work Higgens began, in 96. We remodeled and up dated it in 2011. So everything is pretty new. This we will continue to take care of. It is off the highway, and very quiet. Love the birds. Walking in the desert is unique. And cactus, and so different when you get close. Our son in law and daughter put a re purposed 18 hole mini golf course in. Makes putting fun! Most of our guest try this and get to liking the game. We have a camp fire night and get together for dogs and drinks. The hosts are super nice! Very friendly and helpful. The apartment is clean and nicely furnished. A few minor problems were fixed immediately. Location is quiet and convenient. There are lots of interesting places around for day trips. All in all, a good value for the money. Internet connection is not good, but there is a McDonalds in Florence. We hated to leave and can’t wait to go back! We enjoyed having you come here and visit our part of the southwest. It is fun sharing this with all our guests. We enjoyed the home made cookies waiting for us when we checked in. Property is located in a rural setting that is quiet and peaceful yet close to Florence and city services. Kitchen is fully stocked with utensils for cooking. Owners are very accommodating and friendly. Very good cell phone reception but there is no internet wi-fi. Overall, a quiet, comfortable place to get away from it all. Thanks for staying, here. Have a very merry Christmas, and Happy new year, too! I’m still working on the wi- fi. We loved the guest house. Sparkling clean and very comfortable. Owners were very hospitable. Would jump at the chance to go there again. Thank you for staying at our guesthouse. Enjoyed your visit, hope you can get back this way next year. Sincerely, Len and Marsha. So much nicer than a motel, friendly hosts, nice location, comfy bed and all the amenities. Thank you Tom and Amy for staying here. Come on back! Happy new year 2018! Desert setting, five acers of desert, walking trail, some wildlife. Birds of all sizes. the Quail come in by the dozens in the winter, to drink from the fountains. Hummingbirds, doves, wrens, hawks, a great horned owl visits time to time. Even a snowbird or two this winter. Plants of the desert all to see. Blooming thru out the year. Several kinds of cactus. From yard and beyond. BBQ on your private patio. This a quiet area. But the amazing thing is the way the desert and the sunlight put on the most beautiful display. Every day it's a new show! I have a couple of mt. bikes, if you ask. Horseshoes, for a game. Putting Hole for Golf practice. Mini golf, 18 hole and adding more this fall. Have putters! Fire pit , on site, and on your patio, nice in the evenings, in the winter. my favorite is a roasting of the smores, local wine from the Windmill Winery in Florence. Hiking the near by Box canyon, is a nice easy day trip , with a box lunch you'll need. Great for a average to beginner, to do. Its about three miles long, flat, with a gradule in cline. This was used by the stagecoach lines as a short cut from Florence to Superior, Az. Now when hiking I have a sincere appreciation for good shoes and SUV's. ( I did spot a big horned sheep on a trip out there , it was up near the top, at the beginning of the canyon.) There is a ATV outfit that does charters for this area as well.